Indeed, why not just take Jamaal Wilkes? Wherever he went, the small forward brought success with him, so you were bound to reap some high rewards. Despite being taken 11th in the NBA draft, Wilkes showed no let down in the skills that made him an AP All-American in college and a two-time NCAA champion at UCLA. In his rookie year with the Golden State Warriors in the 1974-75 season, Wilkes took home Rookie of the Year honors as he averaged 14 points and eight rebounds per game. With Rick Barry the clear leader on that Warriors team, Wilkes settled into a needed role as secondary offensive threat and frustrating defender. 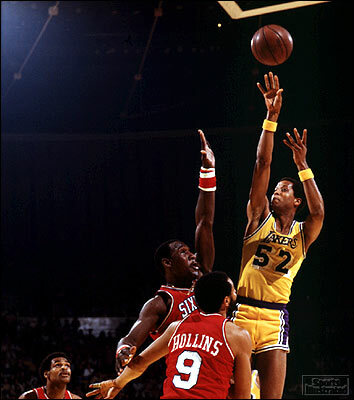 As the 1975 postseason began, Wilkes was somewhat erratic, as rookies can be. He had several games of single-digit scoring and in the Finals against the Washington Bullets he averaged just 11.5 points. However, Wilkes had some well-timed hot streaks that kept the Warriors’ season alive. With Golden State tied two-games-to-two against the Seattle Super Sonics in the Western Semi-Finals, Wilkes helped capture the series with a Game 5 performance of 24 points and a Game 6 encore of 20 points. Against the Chicago Bulls in the Western Conference Finals, Wilkes started off hot with 26 points in Game 1. However the Bulls’ tenacious defense hounded Jamaal into 11 PPG from Games 2 through 6. The slog-fest series came down to Game 7 in Oakland. The Bulls built a 14-point lead, but Wilkes kept Golden State alive with 21 points in the second and third quarters. In the fourth, Rick Barry then took up the slack and slung 14 points at the Bulls to win the game 83-79. In the Finals, the 48-win Warriors swept the heavily favored 60-win Washington Bullets. Those Warriors were in great position to repeat and control the Western Conference through the late 1970s. In 1976, Wilkes was named to his first All-Star Game and Golden State won an imposing 59 games, but they were the victims of a stunning upset. The 42-win Phoenix Suns deposed them in the Western Conference Finals. After another disappointing playoff exit in 1977, Wilkes become one of the first big name players to switch teams via free agency. The three year veteran went down the California coast back to Los Angeles – the site of his college glory years with the UCLA Bruins – joining the Lakers. With the purple and gold, Wilkes averaged 19 points per game and was selected to two more All-Star games. His smooth shooting stroke and unassuming demeanor earned him the nickname “Silk”. The good thing about Wilkes’ silky smooth play was that he could silently knock out opponents on the court. Sometimes you’d look up and wonder how Wilkes had so convincingly put you asunder. Silent assassins don’t cause much of a stir in the publicity department, though. The perfect example of how Wilkes could decimate the opposition without anyone really remembering is his Game 6 performance in the 1980 NBA Finals. Kareem Abdul-Jabbar was the league’s MVP dropping 40 points and 15 rebounds in Game 5 on the 76ers, but a severely sprained ankle kept him out of Game 6. Magic Johnson was the star rookie who famously started at center with a spectacular final stat line of 42 points, 15 rebounds, and 7 assists. Oh, and Jamaal Wilkes? He scored a ho-hum 37 points that happened to be his highest scoring output of the season and clinched the title for the Lakers. When you have three players going for those kinds of numbers (plus Norm Nixon and Michael Cooper), it’s unsurprising more championships followed in 1982 and 1985 for Wilkes and the Lakers. By that third title in ’85, however, Jamaal had been supplanted by James Worthy as the Lakers’ new scoring machine at small forward. After 13 games with the Los Angeles Clippers in the fall of 1985 that everyone would like to forget, Wilkes retired from the NBA. His tough defense, his ability to score inside, outside, and every place in between with jumpers, slithering layups, and superb off the ball cuts – plus his unselfish enthusiasm – helped guide every team he ever played for to the playoffs. The exception of course the hapless Clippers. But let’s chalk up that tidbit to misfortune and leave it at that. As for how good Wilkes was, let’s leave it at this: Rookie of the Year honors, four titles, and three all-star games plus a whole lot of silk-laden moves. Next PostBasketball Philosophy: For the Love of the Game?